Mention the word "boutique" and we think of stylish and expensive. But nowadays not everything has to be expensive. 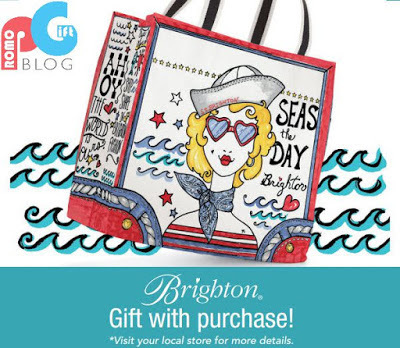 Woman's bags and accessories brand, Brighton's, is offering this fabulously designed "Seas The Day" tote bag. To receive this seaside themed gift it's all your's for the same day purchase of $100 or more in-store and online. Why do we love this seaside themed promotional tote bag? The design of this bag oozes summer at the Côte d'Azur, and the seaside with its anchor, classic sea themed striped T-shirt and 'Ahoy' designs. Perfect for taking on weekend trips, going to the beach or just showing off while you shop. With totes its good to remember that cool and unique tote bag designs are more likely to be sought after, and its more likely a customer will spend in order to receive it - design means everything! Offering a branded tote bag like this as a gift with purchase is always a popular choice and one that never gets old. Giving a free gift with purchase is a way to show customers that you care and offering something valuable (and one that can be used) will increase attraction, encourage repeat purchases and offers word of mouth advertising, so grab your's while you can.